What’s the fuel consumption of an electric car? You’ll be right to reply that it doesn’t need any gas, but at the same time, you’ll be wrong. Just look at the official EPA window sticker below. It’s for the Chevrolet Volt. The Volt is a plug-in hybrid to make it a dual fuel vehicle, running on gas or electricity, and that’s where the problem is. People know gas, people don’t know electricity. So the EPA decided to use energy equivalences. When running on electricity, the Volt’s energy consumption is 36 kW-hours/100 miles. 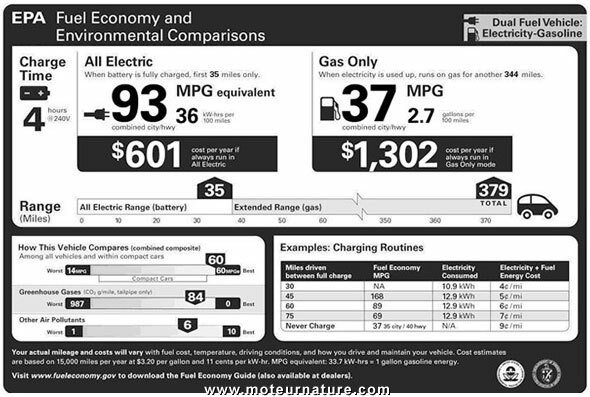 That is the plain truth, the real valid data, but as people are more familiar with oil, the EPA sticker prints in a larger font size, that the Volt has a 93-MPG equivalent rating. It did the same thing with the all-electric Nissan Leaf. The Leaf is a bit more energy-efficient than the Volt, requiring only 34 kW-hours/100 miles, which translates to 99-MPG. 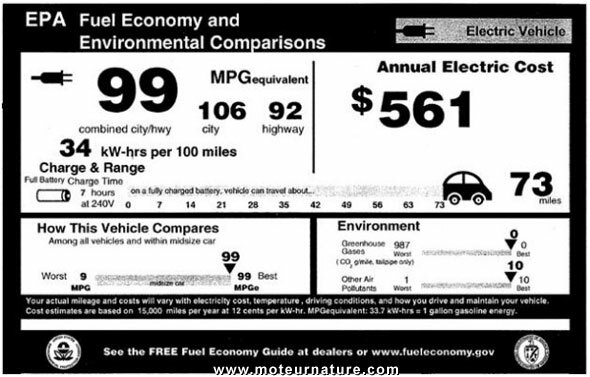 I understand that the MPG rating will be informative to some people, but to me, it’s confusing to give a MPG value to a car that doesn’t have a fuel tank. People need to learn about the kw-hours/100 miles ratings. How about doing the other way around: giving electricity consumption equivalent values to gasoline cars?